The irPistol is based off of one of the most popular pistols in the world. Never before has a laser weapon of this caliber been created. Its realism and functionality will have heads turning wherever it’s used. The weight, function, and action are identical to an actual 9mm pistol. The main modular component is the barrel. The lithium ion batteries, infrared LED, and lenses are stored within and allow the gun to shoot distances of over 150 feet in broad daylight. Indoors, the range increases to 300 plus feet. Internal air-powered pneumatics create realistic recoil and shot noise, adding to the realism of the gun. These pneumatics are powered by our patented SmartMag, which houses the air source and ammo electronics. 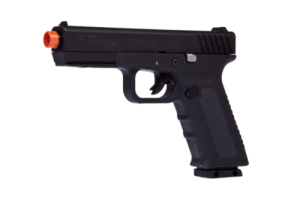 The irPistol SmartMag utilizes an 8 gram CO2 cartridge and is programed for 15 rounds. After 15 rounds have been fired, the slide will lock to the rear. Simply eject the magazine and reinsert it for another 15 rounds. The SmartMag can be reinserted three times on one CO2 Cartridge for a total of 45 rounds before reloading a new one. Each irPistol is constructed of extremely tough cast aluminum and glass filled nylon, giving you unmatched durability in every part. Law enforcement officers won’t be able to find a better solution to train with. The simplicity and realism of irTactical allows for fast, accurate training anywhere. Bad guys beware.